Have you ever noticed how some people seem to be born to sell? They just have the technique, and it seems perfectly natural, not forced. They’re the type who could sell ice cream to polar bears and the animals would thank them for it. Of course, not everyone is that way, and certainly not all the people who make their livings in sales. But even if you’re not born to it, there are still ways you can be an effective salesperson. It takes some effort and a willingness to keep working hard, both on your presentation and research, but it can pay off in the end for everyone. Making a sale starts long before you sit down with someone and offer your pitch. If you’re going to have a booth at a trade show, for instance, you should e-mail your prospects and tell them – and make time for them when they appear. That’s more than courtesy, it’s good salesmanship. Use “tickler files” – whether they’re on paper or on the computer – to keep track of who you’ve talked to about what, and when you have to get back to them. Don’t just make the notes, but follow up on them, too. 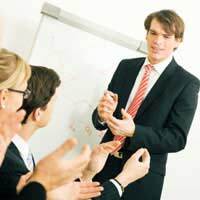 When you’re due to make a sales presentation, take time a few days before to get ready for it. Consider your sales presentation – who is it for, what is the aim? Are you going to be addressing the person who can make the decisions? What do they know about you, your company, and your product? Make sure your presentation is well organised. That means having any visual aids and handouts in place. If you’re giving a Powerpoint presentation, ensure everything is in order. If there’s going to be a demonstration, does your equipment work well? Remember, the more you know everything is ready, the more confident you’ll be when you make that pitch, and the smoother the words will flow. However much you know about your product, you gain nothing by going into excruciating detail about it. All you’ll do is bore people. They want to know what your product can do for them, how it can improve production or save them money. Bear that in mind and keep your pitch short and to the point. You can always go into more detail when they ask questions later. Make sure your appearance is professional, not slovenly; you want to create a good impression. Be sure to speak clearly, and maintain a lot of eye contact. Be confident and enthusiastic about what you’re selling – if you don’t believe in it, why would anyone else? Is your tone of voice appropriate for the situation? At times very professional is good, and at others something a bit more relaxed and friendly is suitable. Have a plan for the sales pitch in your head and stick to it. Remember, you only have a limited amount of time, so you need to use it well – don’t try and extend your appointment. The chances are that you won’t receive a decision then and there, so you will need to schedule a call-back, whether it’s in-person, on the phone, or by e-mail. Make sure you do it – if you can’t follow up properly, how badly do you want the business? - and also send a quick note thanking the person for their time.